(Nanowerk News) Whether packing oranges into a crate, fitting molecules into a human cell or getting data onto a compact disc, wasted space is usually not a good thing. 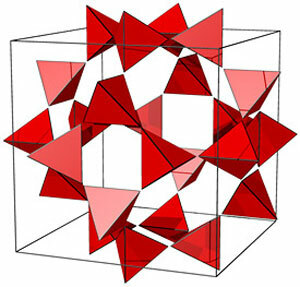 It was already well known that two regular tetrahedra can be combined with a single regular octahedron to tile or fill three-dimensional space. Buckminster Fuller, the renowned American architect, inventor and author who came into the mainstream consciousness when he designed geodesic dome-homes in the 1950s called such a structural relationship the "octet truss." This type of tiling is ultimately related to a structure known as the face-centered cubic lattice, which is the densest possible arrangement of equal-sized non-overlapping spheres in space. By connecting the centers of spheres that are touching one another with lines, the resulting pattern of lines forms a lattice structure, Fuller's octet truss. 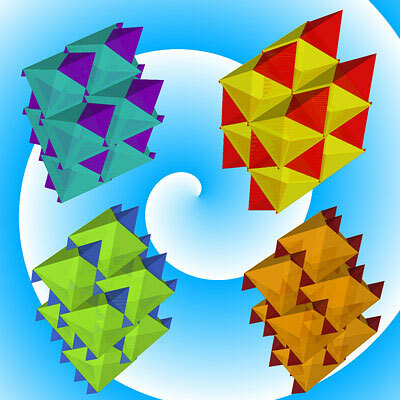 It was long believed that such a tiling and its closely related variants are the only tessellations of three-dimensional space that can be done with two different regular polyhedra.